Now that Spring is in full-swing, it’s time to get cleaning! Last Saturday, May 20th, dozens of neighbors from around EvCC turned out to rid themselves of the clutter which they’ve accumulated over the last year. 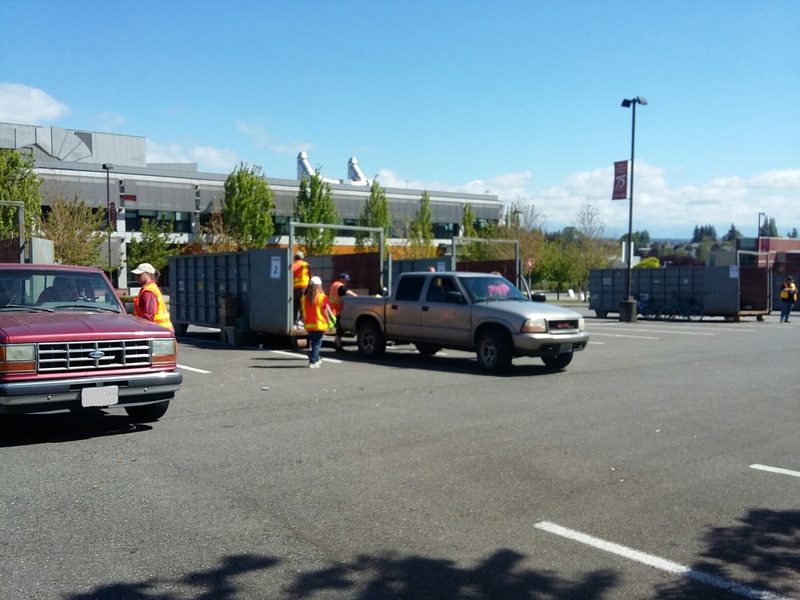 Volunteers from EvCC’s Custodial and Facilities crews helped residents of the Northwest neighborhood throw out or recycle old electronics, scrap metals and lumber, yard waste, and other household items such as carpets, bedframes and more. A big thanks to 3-R Electronics Recycling for coming out to this event! Also saved from certain doom in the landfill were a number of bicycles, which were happily accepted by a local bike shop in town. Although neighbors did not have to pay an entry fee, they were asked for donations to help cover the the rental and hauling costs of the containers. Employees who volunteered their time spoke of this event as a good way for the college to improve its connection and relationship with the surrounding community; something to be appreciated as the college can sometimes forget how its growth and resulting traffic impact our neighbors. This event was sponsored by the Northwest Neighborhood Association, in partnership with EvCC’s Sustainability Team. Check back soon for the next post!